Big data has evolved, due to changes in data storage technology. New data centers, cloud servers, and other types of data storage technology are changing the field in spectacular ways. This is clear to anybody that monitors the Cloudwick system or watches for advances in data lakes. Cloudwick is one of the many solutions that has been impacted by the evolution of big data. What does this mean for other types of data lakes? In the past, storing data on a large scale was a huge challenge for cybersecurity companies. In the past few years, however, with the help of cloud-based storage and new technologies, the concept of using a data lake – rather than the more traditional data warehouse – to store and protect privileged information has changed the way we think about data storage and security. This is going to be more important than ever as big data transforms the logistics of most organizations. When Cloudwick first created its revolutionary CDL to store and economize data, it was tapping into a market trend that would take years to truly flourish. Today, studies show that companies that use data lakes for information storage and security perform 9% better than their data warehouse-using counterparts. When you’re competing at an extremely high level for corporate clients who trust you with their data, that 9% makes a big difference. 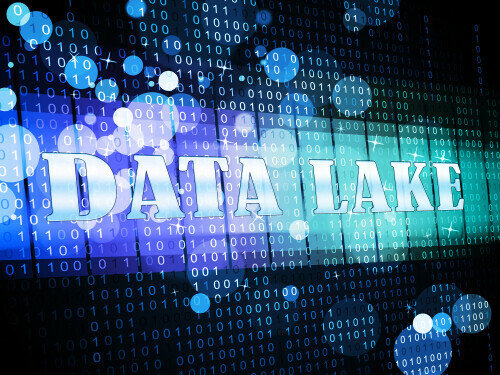 So what is a data lake, and how does Cloudwick use this big data technology to get ahead? Here’s the breakdown. One of the biggest advances in big data was the ability to source and analyze different types of data. Both structured and unstructured data needed to be utilized. When companies try to store data on a grand scale while keeping it protected from data thieves and hackers, they have two choices. The first one, storing the data in a “warehouse,” creates a much narrower environment for this data to live in. For one thing, certain types of data can be “rejected” from a warehouse, and the software only expects refined, translated data to take up space in its limited confines. This is not the case with a data lake. Cloudwick’s CDL gives clients space to store information in its roughest form. This is important because you never want to be in a position where data is being thrown away or stored improperly just because it hasn’t yet been filed or categorized in a useful way. Most companies don’t keep their data in a completely organized vacuum, and there’s no point in storing only part of your data if you’re interested in keeping yourself secure. While a data warehouse only stores polished, translated data, a data lake, such as Cloudwick’s CDL, can accept data in an untranslated form. Why is this important? Primarily, it helps with newer forms of analytics and research, which can easily be turned into information that can help a company boost its performance and out-earn its competitors. Cloudwick’s CDL isn’t just interested in storing older forms of tech. The whole point of a data lake is to make room for of-the-minute updates and performance-enhancing developments in the world of data storage. For companies that don’t want to get left behind, a data lake is the gold standard in data security and storage. There’s another problem with throwing all your data in a more restrictive environment: Hackers and data thieves have a better chance of finding your translated, organized data and siphoning through it with ease. With data lakes, it’s not so simple. Not only is the new technology built to outsmart hackers, but it’s organized in a way that would make it more of a chore and less of a payoff for data thieves to try and break in in the first place. Think about it this way: If you have a valuable object, would you rather store it in a safe and hope that thieves don’t find the combination? Or would you take extra precaution and hide that safe inside an even more complex maze to deter thieves and make it nearly impossible for your valuables to be located, never mind stolen outright. One thing that businesses simply can’t afford to go without is top-of-the-line analytics. This information not only tells a company how it could do better, but also tracks and exposes threats before they arrive at a client’s front door. If you’re running a business and need your data protected, you can’t afford to deal with a threat when it arrives, especially when prevention would have been so simple. Cloudwick’s CDL isn’t just a one-stop shop for security and data storage. It actually helps companies gain insight into their progress, where they’re falling behind, and how they’re exposing themselves to new and more sophisticated threats. Cloudwick’s data lake provides a way for companies not just to grow steadily and keep tabs on that growth, but to use analytics to create a plan for long-term success and unparalleled protection. Not all companies are created equal. Data lakes aren’t either. It only stands to reason that a company’s data storage and security solutions should be tailored to the way they do business. There’s no point in trying to fit a company’s needs into a pre-existing, one-size-fits-all format. That’s why Cloudwick goes the extra mile when it comes to building a customized data lake for every new client. By studying the way a company works, identifying security threats, and studying ways to optimize performance and organization, Cloudwick delivers a tailor-made solution for companies both large and small. Like most businesses, Cloudwick is interested in refining what it does. That’s why it’s not enough to use one industry standard and hope it works for a variety of businesses. If hackers and data thieves keep finding ways to outsmart and outrun even the most sophisticated data bank security systems, it’s your data lake’s job to tailor itself to your security and storage needs. As a highly adaptable, user-oriented service, Cloudwick’s CDL doesn’t just adapt to the current climate; it adapts to your company’s needs using real-time analytics and the latest smart technology. It doesn’t matter what kind of business you’re in. If you’re not making client safety a priority, you’re giving hackers an easy way in. Fortunately, because of new technologies like Cloudwick’s CDL, prioritizing basic security doesn’t have to be a full-time job. By using smart software that adapts to and steels itself against any potential threat to data privacy, you’re making sure that your company never has to suffer a career-ending data breach. Cloudwick understands that thinking about these threats shouldn’t have to take up all your focus. That’s why its state-of-the-art CDL makes cybersecurity second nature. Big data has undergone a fascinating evolution. This is largely due to advances in data storage technology, including data lakes. This will have a profound effect on our future for years to come.